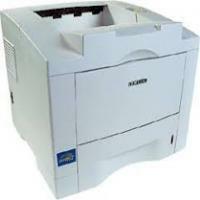 The Samsung ML-6060N laser printer is a monochrome printer that is designed for producing printouts for personal use. Samsung ML-6060N toner cartridges are black in colour. Its monthly duty cycle range is between 10,000 to 20,000 pages. The Samsung ML-6060N printer weighs 10.5 kgs and measures 14.2 x 16.1 x 11.4 inches. It has a good print speeds of up to 12 pages per minute with a maximum print resolution of 1200 dpi. It has automatic document feeder and has a total media feeder capacity lies between 100 to 550 sheets. It can print A4, A6, B5, Legal, Executive and Letter A sized pages. It can print envelopes, plain paper as well as transparencies. It cannot be connected wirelessly and offers LAN and parallel connection. The Samsung ML-6060N have an in-built RAM of 16 MB and can be expanded to 80 MB. It requires Operating Systems such as Microsoft DOS, Microsoft Windows 3.x/95/98 and Microsoft Windows NT 4.0. The Samsung ML-6060N is a simple but powerful device that can fulfill all home or small office printing needs. Being lightweight and compact, it can easily fit into a small space. It is a monochrome printer and Samsung ML-6060N toner cartridges have a duty cycle of 6000 pages. It has an inbuilt RAM and can be connected through wire. It has high print speed and can print envelopes, plain paper and transparencies. Overall, it is a good printer for use and can satisfy user’s needs. How can I solve the general printing problems associated with my Samsung ML-6060N printer? Q. I have ordered toner cartridges from your the online store but, it is not compatible with Samsung ML-6060N printer. What is the return or replacement policy? A. You can return the item within 30 days of purchase. Make sure that the cartridges are in re-saleable condition. We will credit the amount in your account or you can purchase the compatible Samsung ML-6060N Toner Cartridges, we will adjust the amount. We will subject 10% restocking charge if the item you are returning is not faulty. For more details regarding return policy, you can call us at 048 30833221 or email us at info@printerinkcartridges.ie . Q. Can I increase the printing speed? If yes, then let me know how it is possible? A. For fast speed, you can avoid connecting other devices in the USB chain while printing. Q. How to clean drum of Samsung ML-6060N Toner Cartridges? A. Press and hold the demo button for 10 seconds, until the light of the control panel is ON. Discard the page produced after this process. This printing cleans the drum of the toner cartridges. Perform this cleaning process only when you are getting blurred, faded or smeared printouts. Q. Can I print postcard with Samsung ML-6060N printer? A. Yes, you can print postcard from this printer. Minimum and maximum size of the document is 98 by 148 mm and 216 by 356 mm respectively. Q. How can I order Samsung ML-6060N toner cartridges? A. Visit our site printerinkcartridges.ie , search and select the printer Samsung ML-6060N. List of available and compatible toner cartridges will be displayed. Select quantity and availability of stock. If the stock is available, then click “add to cart” and then proceed to checkout. Fill out the relevant details, and place the order. Q. Is Samsung ML-6060N printer suitable for printing needs at home? A. Yes, this monochrome printer is suitable for home as it is lightweight, compact, and can easily fit into a small space. It has high printing speed and can print envelopes, plain paper and transparencies. Q. What benefits and deals do you offer on purchase of compatible Samsung toner cartridges from your site? A. We offer exclusive deals and benefits that are more attractive than others and include money back guarantee, low costs of products, efficient customer support, easy returns facility and many more. We provide offers on toner cartridges of other brands also besides Samsung. Q. What is the page yield of compatible Samsung ML-6060N toner cartridges that you offer? A. The page yield of these Samsung toner cartridges is 6,000. Q. Will warranty of my Samsung ML-6060N printer become void if I install compatible Samsung ML-6060N toner cartridges in it? A. No, your printer warranty won’t get nullified if you install compatible ink cartridges in it. You may be worried due to the warning pop-up messages you might be getting from the company advising against using compatible toner cartridges. Please ignore such messages and exercise utmost constraint while selecting okay or any other option. Q. I understand that compatible Samsung ML-6060N toner cartridges are made by third party manufacturers and cost much lesser than the genuine cartridges, but are there more chances of problems coming up with them since they aren’t brand new? A. No, you can rest assured that though compatible toner cartridges cost lesser since they are made by third party manufacturers, they work good as the genuine toner cartridges. You won’t face any more problem if you use them instead of the original ones. Q. There are times when an urgent requirement for printer components comes up in our office. If we place an order for toner cartridges at the last moment, can you deliver them next day? A. Yes, we offer 1-2 days delivery of products and execute them successfully, provided your product is in stock, transportation environment is favourable and your location is not in a very remote area. Q. Are compatible Samsung ML-6060N toner cartridges that you provide fully tested? A.Yes, we supply only those toner cartridges which passes strict quality assurance parameters. Q. I recently bought a Samsung ML- 1450G printer for my business. I already have a Samsung ML-6060N printer and a multipack of compatible Samsung ML-6060N toner cartridges (Samsung ML6060D6) which I purchased from you last month. Though I bought these cartridges in bulk since they work with my new printer also, will the quality of their output will be as good? Thanks. A. Yes, you can be sure you’ll get the same results when you use these toner cartridges with your new printer also, and can make great savings just like you do with your Samsung ML-6060N. Q. How many days limit do you give for returning a faulty a toner cartridge purchased from you that happens to be faulty? How do you go about it? A. If a product purchased by you from our site does not function properly, we request you to communicate with us within 30 days and provide all relevant details. We’ll give you a replacement or a refund promptly after we get the item and test it. Q. Since compatible ink cartridges are priced lesser and created by third party manufacturers, do they come with good support and services like quick delivery and prompt assistance? I’ve been using original Samsung ML-6060N toner cartridges and would like to begin using compatible ones. Please advise. A. We guarantee 100% dedicated services and support for everything you purchase from us- be it fast delivery, customer support, easy returns or anything else you as a valuable customer rightly expect from us. Compatible cartridges are created professionally in facilities that employ state-of-the-art technology and processes hence we assure you of 100% satisfaction and huge savings if you switch over to them. Q. I’m planning to start with using compatible Samsung ML-6060N toner cartridges in my printer (Samsung ML-6060N) but I’m concerned whether it will void my printer warranty since they are not original. Please help. A. These compatible cartridges will not void your printer warranty, so you need not worry at all about using them in place of original toner cartridges that only made you spend more. Q. I’ve been told that compatible Samsung ML-6060N toner cartridges will help me print more than 1,000 pages in black and also keep costs low. Is that really true? A. Yes, in fact, you’ll be able to print close to 6,000 pages in crisp black text, which will bring down costs dramatically that original toner cartridges don’t. Q. Is the shelf life of compatible Samsung ML-6060N toner cartridges more than one year? A. The shelf life of these toner cartridges is minimum two years. Q. Are Samsung ML-6060N toner cartridges known to print exceptionally good quality documents? I have to submit my business proposal to prospective clients, so I need quality components that also don’t cost me a bomb. A. Yes, these Samsung toner cartridges are used widely in small and medium-size offices for various business endeavors as each cartridge prints up to 6,000 pages of vivid, clear-cut yet easy to read a text in fine detail. You can very much rely on our recommendation for these toner cartridges for your specific goals. Q. Do compatible Samsung ML-6060N toner cartridges adhere to professional quality standards? A. Yes, they are put through stringent quality tests and are certified in ISO 9001 and 14001 besides FSC tested and certified. They also bear numerous other quality certifications, undergo industry standards print tests. Q. Do you offer quick delivery of components like Samsung ML-6060N toner cartridges? A. Yes, we guarantee delivery of components including toner cartridges within a day if orders are placed before 12.00 noon from Monday to Friday.